Drummer D.J. 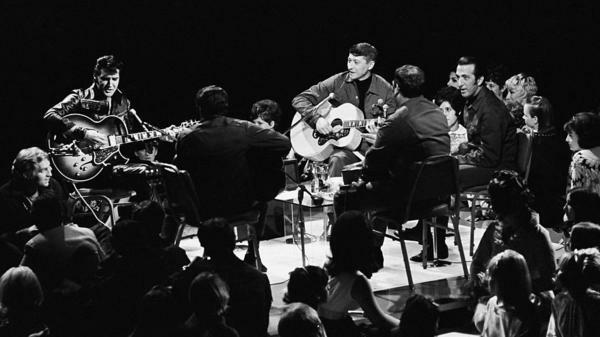 Fontana (far right), on stage with Elvis Presley during the singer's landmark 1968 comeback TV special. Fontana died Thursday at age 87. D.J. Fontana, the drummer who helped create Elvis Presley's early, rockabilly sound and who played with him throughout the 1950s on hits like "Heartbreak Hotel" and "Hound Dog," has died, his wife Karen Fontana confirmed to NPR. Fontana died on Wednesday night in his sleep at the age of 87, while in hospice in Nashville. Fontana was born March 15, 1931 as Dominic Joseph Fontana in Shreveport, Louisiana. In a 1999 interview with music producer and filmmaker Dan Griffin, Fontana said that he began playing the drums in high school marching bands, and started really learning about structure and style by listening to recordings of big bands fronted by the likes of Stan Kenton, Woody Herman and the Dorsey Brothers. Later, he began playing with western swing bands and serving as the house drummer for a popular radio program broadcast from Shreveport called The Louisiana Hayride. When Presley appeared on Hayride with bassist Bill Black and guitarist Scotty Moore in 1955, Fontana sat in with them — and a few months later, Presley asked Fontana to join his group full-time, taking the band from the three-piece setup assembled by producer Sam Phillips at Sun Records to its four-member lineup. Fontana was the last surviving member of that band, after Bill Black's death in 1965, Presley's in 1977 and Moore's in 2016. Fontana remained with Presley throughout the rest of the 1950s, and was a key contributor during the construction of Presley's sound, providing an easy groove that evoked both rockabilly and swing, and helped to define hits like "Heartbreak Hotel," "Don't Be Cruel," "Jailhouse Rock" and "Hound Dog." In all, Fontana recorded more than 400 sides with Presley for RCA Victor. When Presley turned to movie stardom in the following decade, Fontana began playing as a session musician in Nashville for other artists, though he continued recording with Presley regularly and appeared with him on his 1968 comeback TV special. But when Presley offered a spot for Fontana and Moore in his Las Vegas band in 1969, they both declined. The drummer last met with Presley in the mid-'70s. In 1997, Fontana linked up with Scotty Moore again to record an album called All the King's Men, on which they were joined by artists like Keith Richards of The Rolling Stones and The Band. Fontana and Moore also appeared together on the 2000 album Good Rockin' Tonight: The Legacy of Sun Records, backing Paul McCartney on "That's All Right." For his sideman work, Fontana was inducted into the Rock and Roll Hall of Fame in 1999. At his induction, Fontana was affable and modest about his contributions. "This is great," he said at the press conference marking the occasion. "I've had so much fun these last few days. It's a great honor just to be here ... I'm glad I got it before I died."